The 2018 National Drive Electric Week event was a great success. A special thanks to the City of Charlotte for partnering with the Centralina Clean Fuels Coalition as co-hosts this year. While Hurricane Florence approached, the weather held out to accommodate our audience of about 125. Everyone from members of the public strolling by to City of Charlotte department heads were able to come out and engage electric vehicle owners and transportation options table vendors. A special thanks to ChargePoint, who sponsored the first 55 free popsicles from King of Pops to attendees. The audience had electric vehicles to view, popsicles to munch on, a great band from the city as well as supported vendors from all aspects of sustainability and green transportation options. 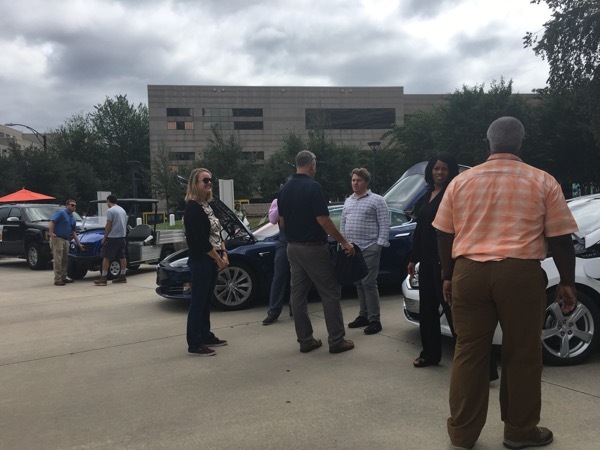 We had great diversity in the vehicle showings: the new 2018 Nissan LEAF, Fiat 500e, Chevy Volt, Teslas S and X, Chevy Spark EV, Mitsubishi Outlander PHEV, an electric utility car from Carolina Golf Cars, the Toyota Prius Prime and others. A big thanks to the greater Charlotte community for coming out to recognize that electric vehicles (and hybrids!) are an efficient form of transportation that can benefit not just owners, but communities as well through mobility management, a reduction in the use of petroleum and a cleaner environment! (L to R) Electric utility vehicle from Carolina Golf Cars, courtesy of Barrett Kittrell; 2017 Tesla Model S owned by Banks Baker; and a new Chevy Volt owned by the City of Charlotte. 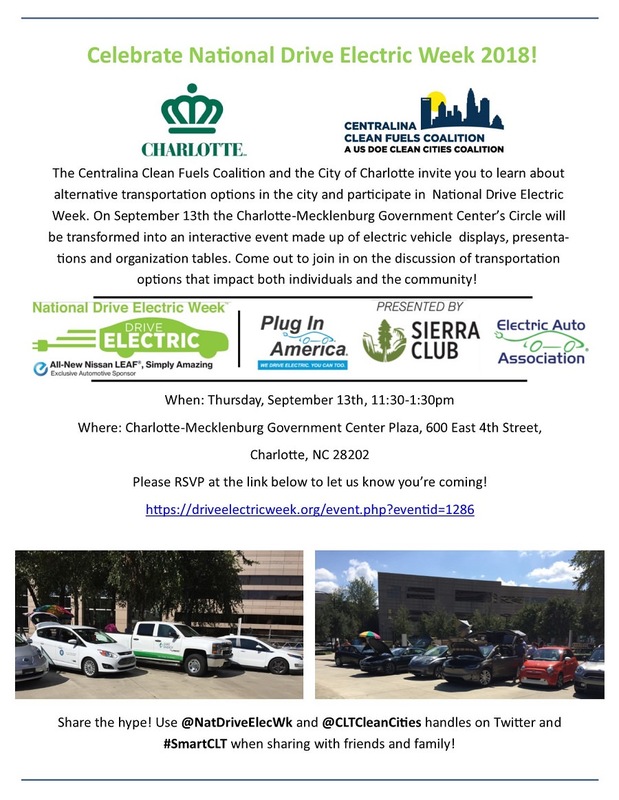 Come join the City of Charlotte in partnership with Centralina Clean Fuels Coalition in celebrating and learning more about electric vehicles and sustainable transportation! This interactive showcase event is open to the public and will be held at GovPorch in front of the Charlotte Mecklenburg Government Center on September 13th from 11:30am to 1:30pm. There will be multiple electric vehicles on display, information and resources from community partners, food, and entertainment. We hope to make it our biggest Drive Electric event yet. There will be a logistics and confirmation email sent out to those who register as we get closer to the event. Parking in the semi-circle is limited, so cars featured there will be on a first come, first served basis. See you there! For vehicle exhibitors or potential vehicle exhibitors: Unfortunately since this hurricane is recent news, we are not able to move the date nor plan around it. We will remain outside as long as possible pending rain in order for attendees to be able to view your vehicles. I know that you are very proud of them and we want our community to know that you care about our environment and saving money, so we will make a judgement call if conditions get too bad. If we do end up inside, we hope that you will stay and share your vehicle information and knowledge of electric vehicles (EVs) with attendees as a networking event of green transportation choices. A suggestion if it looks like rain, would be to create a fact sheet of your car with some pictures of your vehicle on it if you’re feeling ambitious, to share with attendees. Also note, we will make every effort to accommodate as many vehicles as possible in the semi-circle and therefore may ask smaller vehicles to double up to ensure space for everyone. Please look for volunteer Chris Davis for assistance. For table vendors: We will remain outside as long as possible pending rain in order for attendees to be able to view your tables. However, if we are outside, you have materials for a table and it is windy or sprinkling rain, please plan accordingly. We will move inside if conditions worsen and continue the event as a greener transportation choices networking event. If you intend to bring a bicycle or scooter to display, please note that it will have to be checked by security in order to be moved inside the government center. In addition, the bicycles and scooters can not be used while inside and should only be demo-ed outside on pavement, not on the plaza area. Please look for volunteer Robbi Walls for assistance. For attendees: We will remain outside as long as possible pending rain in order for you to be able to view vehicles, talk with table vendors, and enjoy some popsicles! ChargePoint has graciously donated the first 50 popsicles from King of Pops but unfortunately will not be available as they are busy preparing for the storm. If we do move inside, please note that since the networking event will be in the government center, you will have to go through security in order to be let in. Please check back frequently for event information updates. 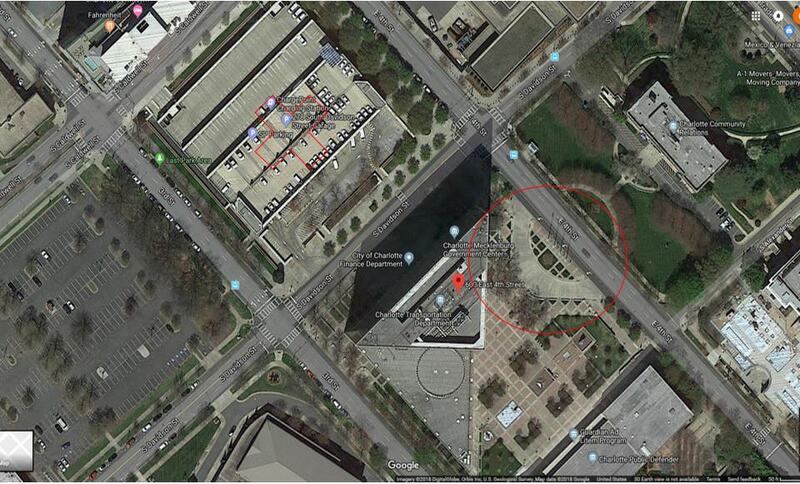 The red circle shows where EVs will pull in to park to be displayed and the red 'x' shows where attendees and overflow EV parking will be available. There are also a few EV charging stations inside this parking deck, but they may be in use by city vehicles, so please plan accordingly. There are currently 83 attendees registered. Registered attendees report 374,873 electric miles driven.